I had the pleasure to DJ Caleb and Claudette's wedding earlier this month at Martins west in Baltimore MD. Claudette was beautiful as always and Caleb was as cool as ever. Thanks for switching up your dj so I could be a part of your special day. See you at Memories soon. Caleb and I can't thank you enough for djing at our wedding, everything was perfect and you played the best songs throughout the whole night! 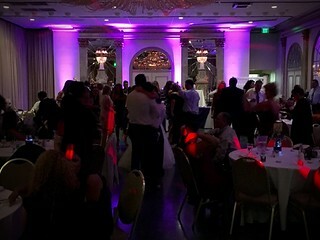 The uplighting was perfect, everything was great- thank you so much for your services, you did an amazing job!